Introducing the new Star Bonus! Win five stars in Multiplayer attacks in order to win a daily resource bonus! 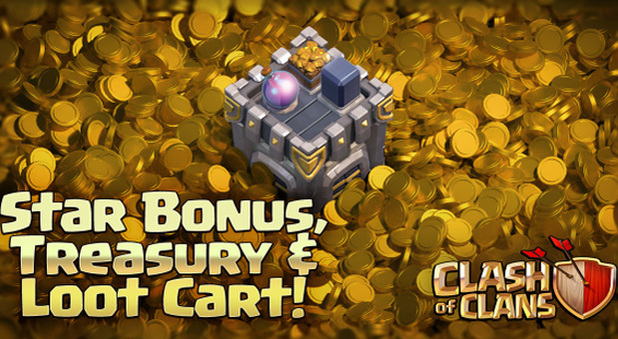 Housed in your Clan Castle, the Treasury is the safest place to store resources. Your daily Star Bonus and War Loot Bonus are automatically stored in the Treasury for safeguarding and only a very small percentage can be stolen. Last but not least, we’ll introduce the Loot Cart. After your village has been attacked, a percentage of the stolen resources will be added to a Loot Cart in your Village. Once you collect the resources from the Loot Cart, these will be transferred to your Treasury for safeguarding. Besides these new features, the update will also include a few bug fixes and battle balancing tweaks. We’ll provide more details soon, stay tuned! WTF? Why why why does Supercell need to focus on complicating the game instead of streamlining it and adding features the community wants instead of their incessant quest to get more players to use gems? The irony is that many of the communities ideas would most likely make the game much better and net them more gems. Why? People would play more! While many of the ultra elite war clans have moaned about th9 being too easy, I personally have found it pretty balanced. TH10 and 11 appear to have gotten a lot easier, especially th11. But what really matters is that the Trophy pushers have all gotten the updates they wanted. When is the update coming out? Hopefully soon but no one knows for sure. Hopefully Supercell fixes this latest mess and focuses more on the war community and makes the game more playable. Previous articleGoogle Cardboard Helps Save Lives!